Enjoy our Minden Hotel's Premier LocationThe Holiday Inn Express Hotel & Suites is ideally situated at the intersection of US 395 & State Route 88; near Lake Tahoe and the state capital, Carson City, NV. Hotel guests, whether business or leisure, can make the smart choice and stay with us.For the leisure traveler our hotel is the perfect base camp for hiking, biking, fishing or golfing in the Carson Valley. Enjoying the scenic beauty of Lake Tahoe, its ski resorts and various outdoor recreational opportunities, and night life just 20 minutes away or all the sights and attractions of Carson City, Virginia City and Reno NV. Our Minden hotel's has many corporate amenities for the business traveler, including a Business Center with copy, email and print services, as well as a public computer and free high-speed, wireless Internet access. 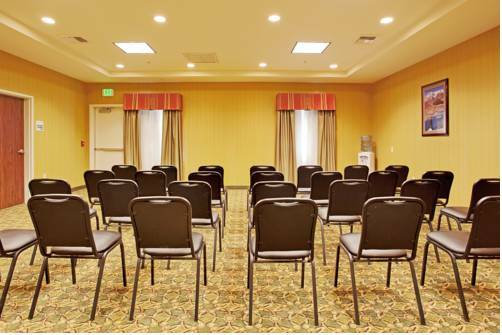 If you have business meetings in Carson City, NV, our hotel puts you in close proximity as it's just 15 miles away.Looking for hotels near Lake Tahoe or Carson City, NV? Our hotel is the place for you. From well-appointed rooms with breathtaking views to a hot breakfast bar served every morning, we have it all, even a Fitness Center and whirlpool area. Check out our Minden hotel's great rates today! Job's Peak: Job's Peak is perfect for board meetings, located across from the business center and will accommodate 49 persons. Walmart Super CenterNear the Walmart Super Center north of us,is a Target, Home Depot, Cosco,Pet Smart, Best Buy, and many other large name and privately owned boutiques. There is also a brand new Walmart Super Center in Gardnerville, south of us about 4 miles.